The food nutter | Love food? Stop counting calories. I love food and this is what I eat! Enjoy! 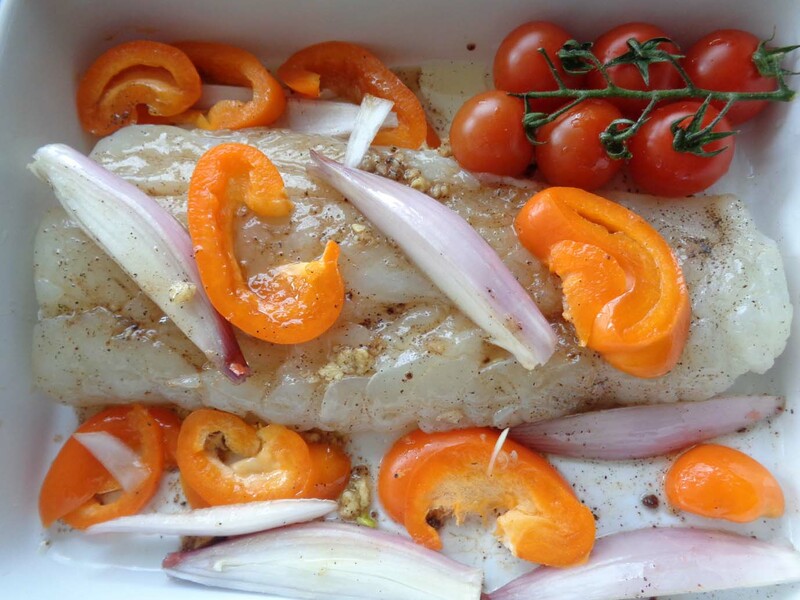 Rinse the cod and place in the large oven dish. Slice the fish in as many pieces as required (here 3). Crush the stock cube and sprinkle it on the fish, also crush the garlic over the fish. 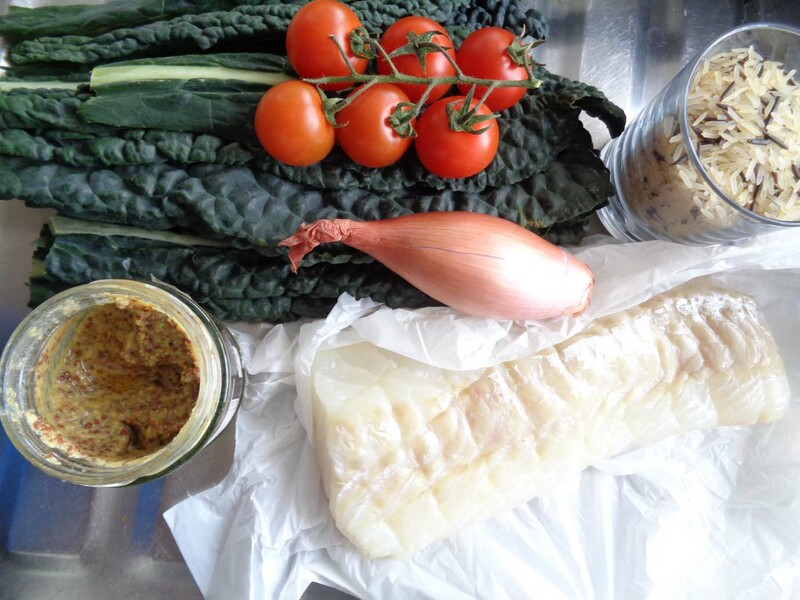 Add black pepper and a drizzle of mustard oil and massage the fish making sure that the garlic and stock cube cover the fish in every sides including between slices… Cover with cling film and place in the fridge for 15-30 minutes or so. Preheat the oven. In the meantime, cut the orange pepper in wedges, cut one half of the shallot in about the same size. After marinating the fish for 30 minutes, bring the oven dish out and scatter on the fish, the pepper and shallot wedges. Also add the vine tomato. Sprinkle salt on everything and another glug on oil then place in the oven for 20 minutes at 200°C. Do not forget to base every 5 minutes it as it will dry out. Once the fish is in the oven, put the rice to cook following the instructions on the package. Add a pinch of salt and 1 spoon of mustard oil. Time to prepare the Side dish of cavolo nero. Rinse and remove the spine of the cabbage leaves then cut in 2-3 each leave. 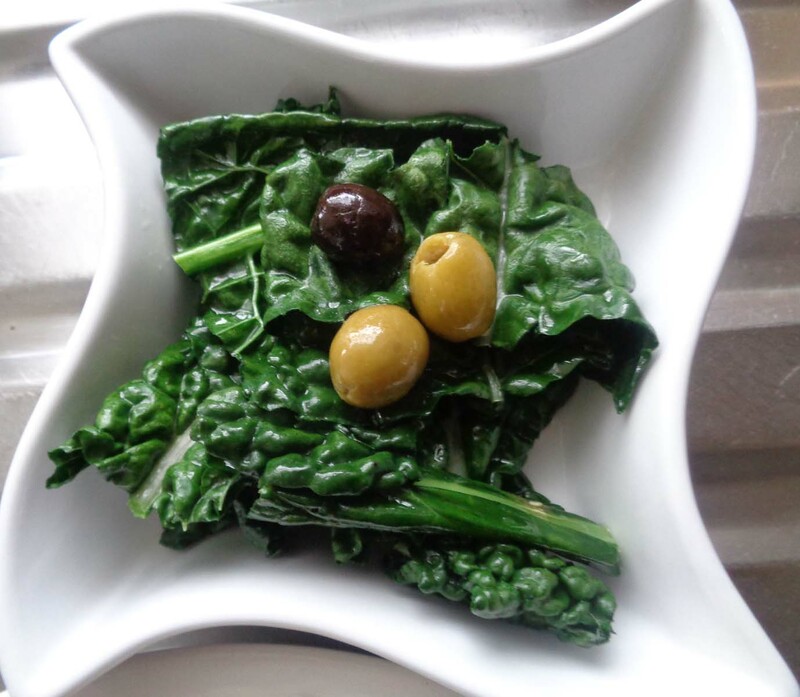 Place the cut cavolo in a heat proof bowl then add the antipasti olives with a drizzle of oil from the olives jar. 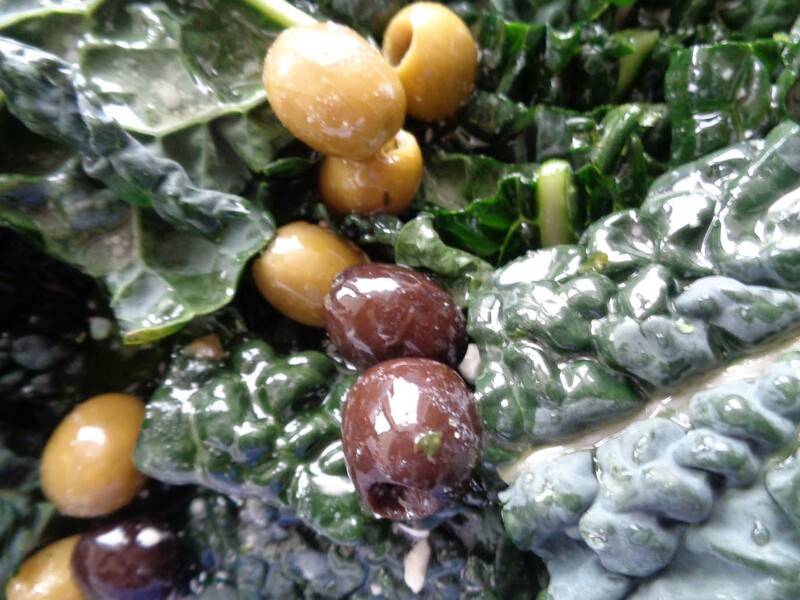 No need to add salt as antipasti’s olives are already vinegary-sharp. Mix well and set aside. This bowl will need to go in the microwave for just 5 minutes just before serving. 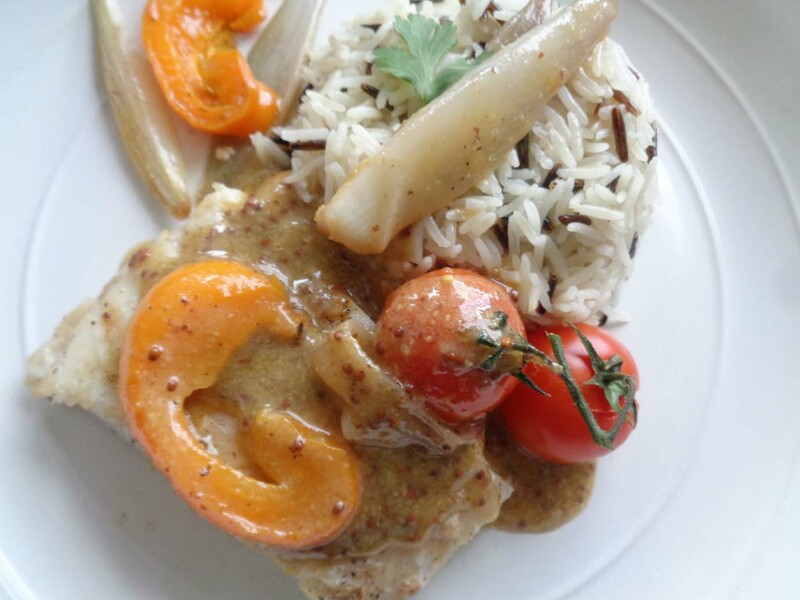 By the time you start on the mustard sauce, the fish should be resting. 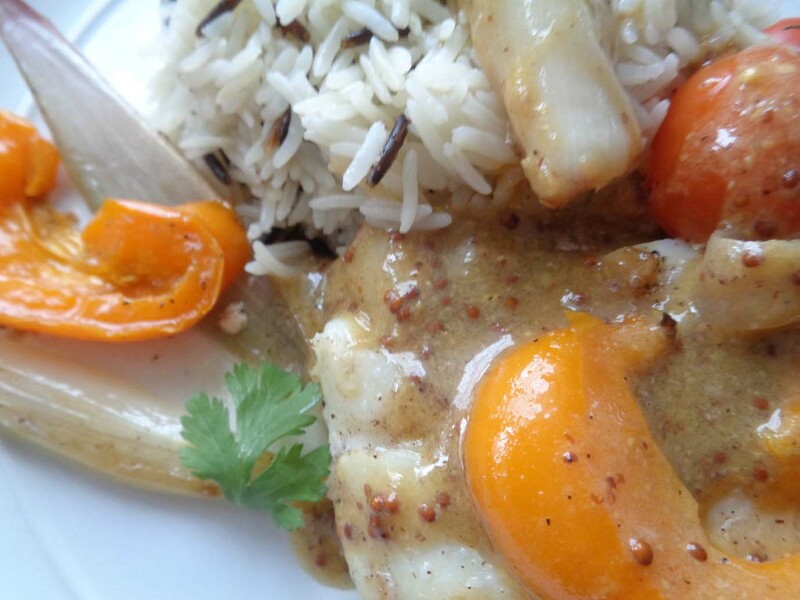 So, collect the juices from the now resting fish and pour it in the sauce pan with the quartered leftover shallot. Add a tablespoon of butter about 25g. Also add 100ml of white wine (I used a French white chardonnay) and black pepper. Leave the mix to simmer and the wine to evaporate a bit. This should take 3 minutes. Watch out for the foaming. When the wine stops foaming. Add the mustard and stir continuously for 3 minutes. Adjust the seasoning and switch off the heat. 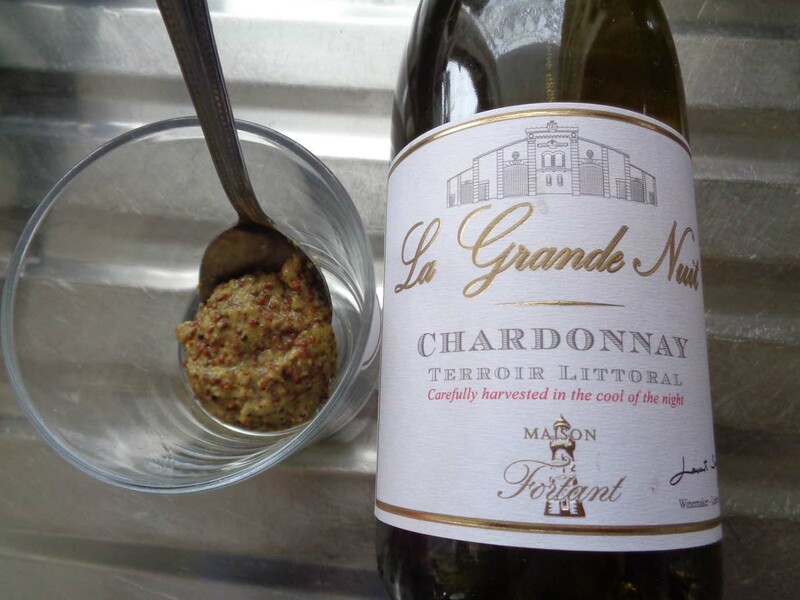 The combo white wine and mustard can be a bit acidic, which can be very good for fish. But if you don’t have white wine, use lemon juice instead. 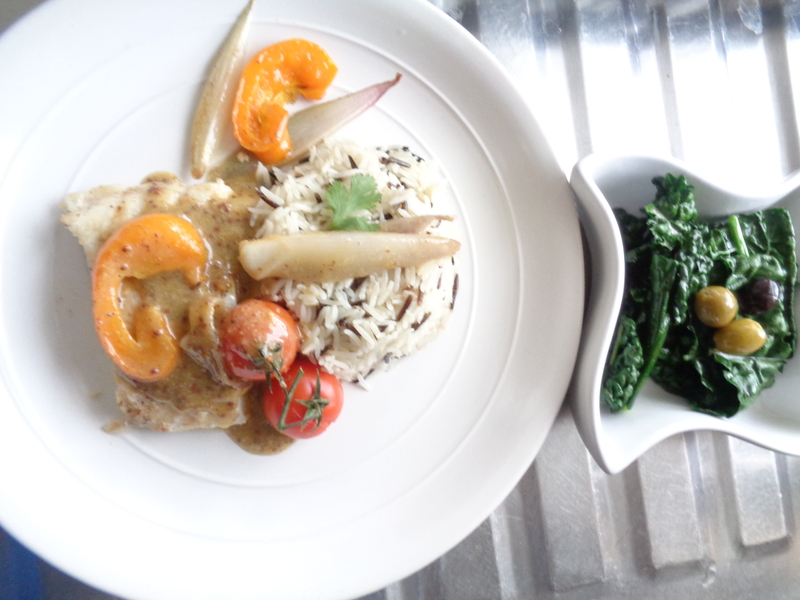 Serve as suggested with a steamed Basmati & Wild rice and a side of warm Cavolo Nero with mix olives. Cut 7 of those apples into small pieces and place in a small pan with 500ml of water and 50g sugar. Cover and leave to cook for 20 minutes. Once the apples are cooked pour into a sieve to remove the excess water. Using a hand blender, blitz to obtain a very smooth paste… That paste is called compote. Remove the pastry block from the package, place it on a flat surface (or kitchen worktop) dusted with flour. Then, using a rolling pin or a wine bottle, press down the pastry evenly, but not too thinly. What you are looking for is the pastry wide and thick enough to fit in to the cake dish. Once that is done, gently flip the pastry on the rolling pin, then transfer it on the baking dish. Now, using your hands flatten the dish on the base of the dish, then prick it with a fork to allow steam to escape from the base while the cake is baking. Trim and remove the excess pastry*. Now pour the compote over the cake base, then thinly slice 5 apples and align the slices as shown on the photo. Once the whole surface of the cake is covered, place the tart in the oven and bake for 45 minutes at 180C. In the meantime prepare the chocolate sauce. Melt 25g of sugar in 50 ml water. Set aside. Break the chocolate into small pieces and place in a heat proof dish. Bring water to boil in a sauce pan, then place over it, the dish containing the chocolate. Stir gently until the chocolate is fully melted. Now add the butter and continue to gently stir until the butter disappears. Take the mix away from heat, then add in the sugar & water mix. Stir quick to make a smooth sauce. Following these proportions the sauce should be liquid enough not to set even when it cools down. Once the tart is ready, allow 30 minutes to cool down before serving. The little hearts on the photos are made from the extra pastry trimmed further up. Using my rolling pin again, I rerolled the pastry and cut it in hearts and lips shapes. The shapes were baked for 10-15minutes, cooled down, and then dipped into the chocolate sauce just after I melted the butter in it. Plate and serve as above. Separate the lettuce gems and wash the leaves one by one as they can be very very sandy. Roughly cut the bigger leaves by hand in 2 or 3. Place them in a colander to release the extra water. Now that all is ready, in a big bowl, combine the lettuce, tomato and oysters (without the liquid from the tin). The oysters are slightly salty, but you might have to add a very little pinch of salt and pepper to it. Drizzle the oil from the smoked oysters on the salad and also the juice of a half lemon. The lemon is optional. The salad doesn’t really need it. Another way to make the oyster starter can be found on a post published previously here. Start by the meatball: Remove all packaging from the meat and place in a bowl. Finely chop half of a medium onion, garlic, a handful of curly parsley and add to the mince. Also season with salt & pepper, then combine well using your hand. Now form the meatballs as big or small as you’d like. And place them in the saucepan you will be using for the tomato sauce. You would have noted that there is no eggs or bread crumbs added here as they are not really necessary. Meat has a natural binder. Now place the pan on a medium heat making sure to very gently turn each meat ball from side to as the meat browns. Allow 1-2 minutes per side. Once this is done, remove the meat from the pan leaving the pan on the heat. As the meat cooks, it will release fat and we are going to use that fat to make the tomato sauce. For the sauce, chop the remaining half onion and fry it in the meat fat for 2 minutes on high heat. Now add the chopped tomatoes, stir and cover for 10 minutes. After the 10 minutes, stir the content of the pan, then add the meatballs and ketchup. Stir and add 200ml water or stock if you wish. Adjust the seasoning, stir and leave to simmer for another 10-15 minutes. Now time to cook the pasta. Follow the instruction on the package. Boil the water with a table spoon of oil and salt. Just before serving, chop the remaining Parsley, add the pasta and toss. Green plantain & black beans stew. Mains for 6. Rinse the chicken, make few deep scoring on the chicken pieces. Pour the marinade over the chicken, mix well and leave in the fridge overnight. Prep: Don’t forget to soak the bean the day before and boil them for an hour before using in the stew. Cut the red onion in big chunks or wedges, cut the sweet pepper in about the same size. Peel and crush the garlic, set aside. Method: Use a big pot with a lid. Heat 4 tablespoons of corn oil (or any vegetable oil) fry the chicken pieces to seal in the flavours and obtain a brown crispy skin. 2 to 3 minutes on each side should do. Once all the pieces have been fried. Set aside and cover. From the time the plantain is added, the total cooking time should be 1hour and by adding the chicken half way, it means that the chicken won’t fall off the bones but will be very well cooked and as soft as the plantain.